Fun Friday activities are quick-and-simple ways to explore nature in your own backyard. Take a spring nature walk around the neighborhood. Our winter nature scavenger hunt a couple months ago was such a hit that I figured another was in order, especially since the seasons have changed. I chose this checklist for our hunt because it requires kids to use multiple senses in their search efforts. They are asked to look for things to see, hear, feel and smell. We celebrated The Little Explorer’s second birthday this week with our nature walk adventure. We keep things pretty low-key in our family, so this seemed like the perfect way for us to enjoy some time together outside on a lovely spring evening. Now having a few scavenger hunts under his belt, The Big Explorer was eager to get started. His first task: Smell the grass. When he proclaimed it smelled wonderful, I knew things were off to a great start. and then something rough. In the space between the sidewalk and the street, we saw plenty of weeds. The Big Explorer chose this amazing flower to touch – right after seeing a bee fly out! Meanwhile, the birthday boy was all about playing his own game of “monkey-see, monkey-do.” When brother ran his hand through a pile of leaves, so did he. When The Big Explorer chased a squirrel up a tree, The Little Explorer followed close behind. We stayed staring at this little guy high up in a palm tree for quite a while before heading for home. I was amazed by all the signs of spring in our neighborhood – new growth on trees that were bare during our winter nature scavenger hunt just two months ago. Plenty of brilliantly colored blooms that took our breath away. And there were sounds to listen for, too. Like a bird chirping, dogs barking and the wind rustling the leaves. In spite of the fact that we haven’t had rain in weeks, we also found mud and a worm. The Big Explorer was so pleased with his find! Our last discovery of the walk was a nest in the same tree that was bare just a couple months back. Nature’s reminder that new life begins again. I couldn’t think of a better way to celebrate this special day. Adapt your checklist as needed. I considered the list we started with a starting point. As we heard and saw things on our walk, I told The Big Explorer to add the items to our list. Now we’ve got a more personalized version for future explorations. Compare notes from one walk to another, or from one season to the next. We talked about how things looked, sounded and felt different now than during the winter. And you can bet we’ll be taking another nature hunt come summer. 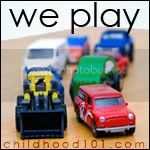 This post is just one of many dedicated to play at the Childhood 101 “We Play” link up! Head on over for more ideas. There’s a beautiful world waiting outside for your kids to explore. What are you waiting for? What a great idea for a post – thanks so much for including me! I&#39;m off to go check it out now. Hi Debi! This is such an awesome post. I love your checklist, it’s very inspirational and really gets the kids thinking. There were some things on there that I would never even have thought of putting- like “something moist or wet” or the different shades of green. We recently used this very list on our camping trip and it was a hit. Hi Sarah – lovely to meet you! Thanks for your sweet comment. I&#39;m heading over now to check out your blog. Yay! Couldn&#39;t agree more about scavenger hunts that incorporate all the senses. It adds another layer of fun to the search. We just did this scavenger hunt today as a Spring Equinox activity. The kids loved it! I especially like that they had to do more than just look for things. Thanks for this idea! You are doing such a great job of teaching your little men about nature … So many people think you need the wide open spaces of the country but you are working with what you have in an awesome way…<br /><br />That passion flower is so pretty. My mom used to have those in our backyard… love them! <br /><br />Happy Birthday to your little guy! Mel, most definitely will add the &quot;something that remind you of yourself&quot; item to all future hunts!<br /><br />Christie, you&#39;re welcome in our sand box anytime!<br /><br />Miss Carly, nice to meet you! Great post. I love scavenger hunts and love that you incorporate the different seasons. There are so many things I love about this experience. That it was simple, quality time together for a special day, the sensory treasure hunt list, that you added things to your list along the way, the changes you noted between seasons. So much practical learning goodness wrapped up into fun family time. Wish I could come and play too! We LOVE scavenger hunts. I have started making scavenger hunts for practically everything we do. For my son, I write the words so he has to read them and I draw pictures for my daughter. Right now, I am making one for the farmer&#39;s market that we frequent. Scavenger hunts are such a great way to engage the kids.